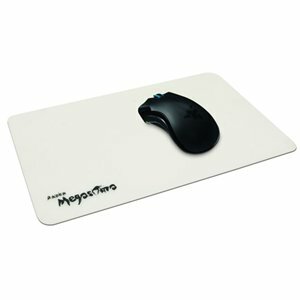 The development of the Razer Megasoma was driven by a single goal; create a mouse pad that compromises nothing. We combined the best features of a hard and soft mat to create a hybrid of tracking excellence. The result is a pro gamer validated mat that blends the legendary tracking of our hard mats with the comfort and feel of our soft mats. Constructed from highly durable translucent silicone and accented with a luminous imbedded logo, the Razer Megasoma is the most tracking proficient mouse pad ever created. Nothing compromised; nothing comparable.